World Real Quick Info: How to protect yourself from Banking Frauds? How to protect yourself from Banking Frauds? Bank fraud can ruin your Personal and Business Finances. Now a days thieves and scam artists are inventing new tools and techniques to steal your money and corrupt your Business. In this Stay Alert – Series 1 I will mention a few common Banking Frauds and security threats to Bank / Any other Financial Institute Account Holders, and some prevention suggestions that can help in reducing your chances of falling victim to various Fraud incidences. Remember, no Bank in the World will insist their Customers' for their Personal details. There are 3 types of fraudulent modus operandi – Phishing, Smishing and Vishing. 1. Phishing is defined as any attempt to obtain your Personal and Financial information. Mostly, Phishing is carried out via Emails that appears to have been sent by a legitimate party, such as a Bank, Financial Institution or any well-known Business House. These Emails lure the targeted victim into visiting a fake site and giving away confidential data. Phishing attacks also use fake SMS's (called SMiShing) and fake Telephone Calls (called Vishing). 2. Through Smishing, fraudsters try to acquire your information via step-by-step instructions sent by text message from what appears to be a credible source. The Text leads You to access to fake Website and enter Your Personal details. 3. 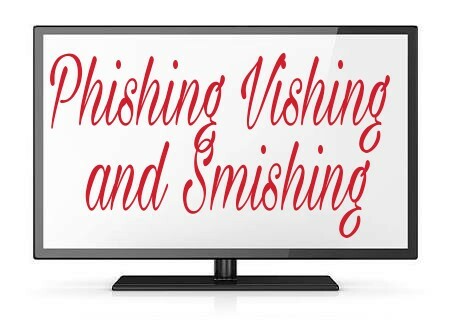 What we are discussing here is related to Vishing, also known as voice Phishing. Several instances have occurred wherein people receive phone calls that appear to be from Their Bank. The caller usually pretends to be a Bank representative or someone from the Bank’s Technical Team. In most cases, the caller sounds professional and provides a convincing reason for calling the Customer. After having given a false sense of security. The caller with above 3 Modus Operandi’s tricks the victims into giving away their Personal and confidential data and withal such crucial information at hand, the fraudster can easily carry out illegal financial transactions using the victim’s name. -The card's CVV number (Card Verification Value) - 3 to 4 digit number printed on the flip side of the card. -Internet banking login ID and password and other personal information. With all such crucial information at hand, the fraudster can easily carry out illegal financial transactions using the victim's name. Enroll for Online Banking and frequently keep checking your Account activity so that you can immediately report suspicious activities if any traced in Your Bank Account. Report any and all lost or stolen cheques, Debit Cards, or Credit Cards promptly to the Concerned Authorities in Bank and Local Police Cyber Cell. Use One Time Password (OTP) or Unique Passwords for every Debit Card or Credit Card transactions through system / websites you may access. Always opt for Online Bank Statement instead of Physical one to avoid misuse of Your Personal information. If you are a victim of fraud, contact your local Police Cyber Crime Office and Bank / Financial Institution immediately. Always "Stay Alert and Stay Safe".